Do you always end up saving a little bit of marinara sauce in the fridge because you didn't use the whole jar? And then throw it away two weeks later because who's gonna eat such little sauce? I do that every time we eat pasta! This recipe calls for that little bit of sauce that nobody wants. Cheer up, Little Sauce! You now have a purpose! Unless you're one of those people who always makes their marinara entirely from scratch. With fresh tomatoes from your own organic garden. Using a wooden spoon that you carved yourself from reclaimed lumber. Suddenly I am filled with feelings of domestic inadequacy. Cashew sauces have been around for years, but I don't make them very often because cashews are expensive and I am not made of money. My mother used to make this creamy pasta sauce about once a week, but she used to make it with heavy cream instead of cashews, of course. The trick is to use a very flavorful marinara sauce instead of just plain tomato sauce like most pink sauces are made with, because along with a garlic clove or two, it is the main source of flavor for this one. 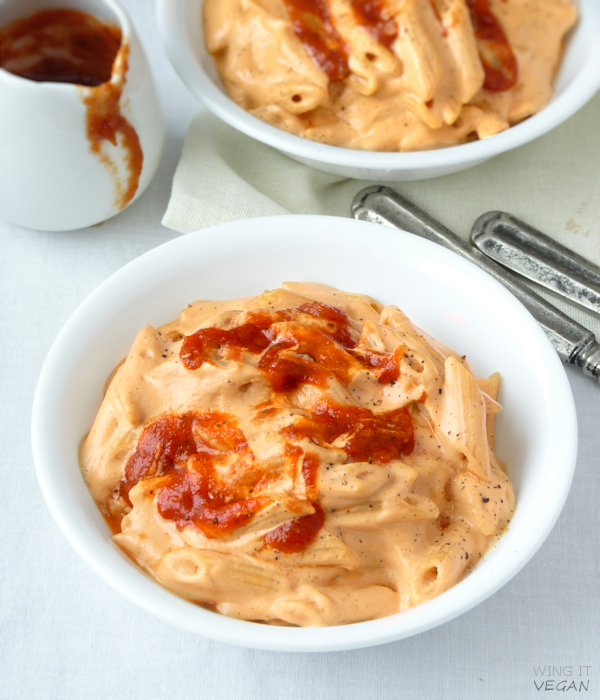 Most pink sauces also call for onion, but this lazy-friendly recipe doesn't. It has a fairly mild flavor, unless you really go to town on the garlic! No cheese. No cheeze. No nutritional yeast. 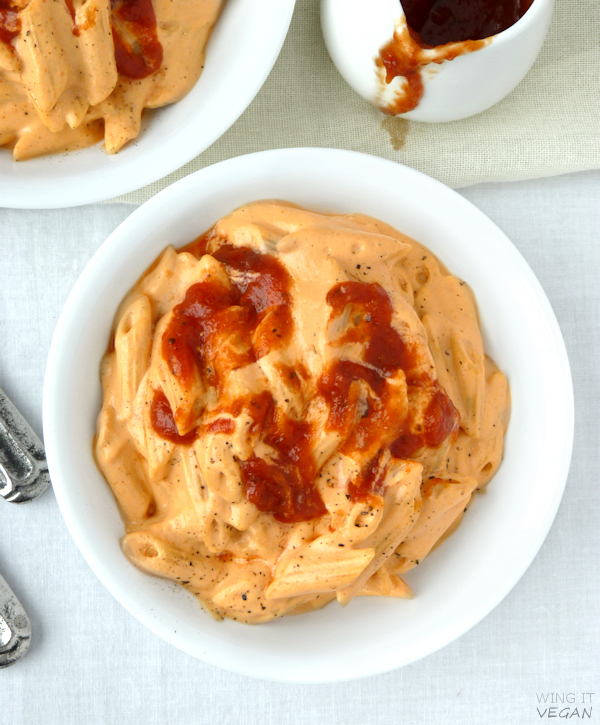 Just creamy cashews and a hint of sauciness. An average serving of pasta is two ounces, but I find that one and a half is plenty for this dish because the cashew sauce is very filling. This recipe makes enough for two people, especially if served with a side of roasted veggies or a salad. 1. First, get your pasta started. Follow the directions on the box. My penne took seven minutes to cook. The penne should be al dente because it will cook a little bit more with the heat/steam of the sauce. 2. While your pasta water is heating, preheat a saucepan over medium heat. Pour the olive oil in the center, throw in the garlic and cook until fragrant and golden. 3. Throw the cooked garlic into your blender, add in the soaked cashews, marinara sauce, and milk, and liquefy until completely smooth. 4. Pour the sauce into the saucepan where you cooked the garlic and heat it gently over medium-low heat. Add a little salt and black or white pepper and give it a taste. Add more salt and pepper until you're happy with your sauce. It should be a creamy sauce, but not super thick. You can add a little bit more milk to make it more fluid if it's not workable. The consistence should be similar to pancake batter. 5. At this point, your pasta should be al dente. Drain it well and pop it right on top of the sauce. Coat the pasta with sauce thoroughly and serve immediately while it's hot. If you want, you can drizzle a little more marinara on top of each serving. The key phrase here is "no nutritional yeast." I can't stomach the stuff, so I give you high praises for making this sauce and sharing the recipe! Thank you! I come for your surreal sense of humor and stay for the recipes. The lazy-ist cook in me thanks you for this inclusive sauce recipe ;) Leave no marinara behind! Leave no marinara behind! I like it - we should start a pro-marinara-leftovers campaign. I'll get started on the t-shirts. Wasting food is a most grievous matter indeed! I don't think I have ever popped leftover pasta sauce in the freezer, but it sounds like a great idea. Thank you! This looks gorgeous and I can't wait to try it next time I have a kitchen. 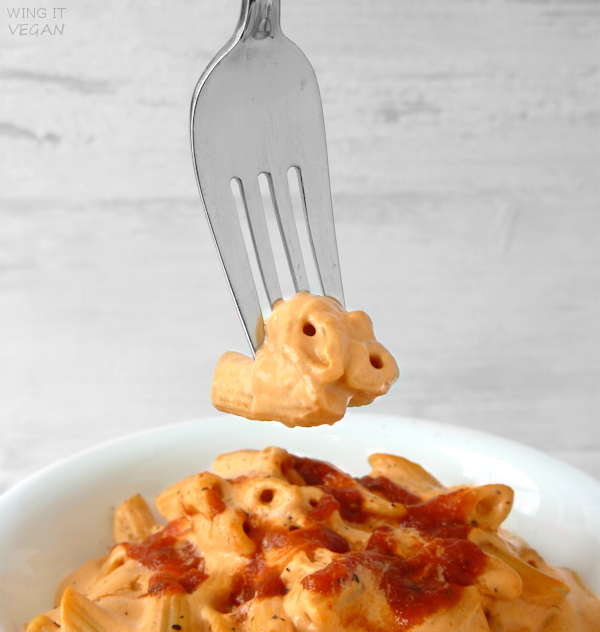 I always have that little bit of marinara in the fridge (either jarred or homemade from tinned tomatoes depending on the week) and as I was recently diagnosed with an allergy to peppers (including paprika, so sad) I can't make my go-to cashew cheesy sauces any more. This looks so pretty. I have some left over passata sauce in the fridge right now from a casserole I made. You go ahead and nooch it up all you want! You do you, Susan, you do you. I do quite enjoy noochy sauces too though.